Paper Garlands and Buntings in and of themselves are fabulous. Paper Garlands and Bunting with incredible colors and patterns from ShopWildThings are an absolute MUST for whimsical party scene-setting. Our colorful Cloth-Like Paper garlands are textured and make an adorable candy buffet table backdrop. Simply choose the color patterns that match your party theme and hang the buntings in seconds! They are lightweight but still made of thick paper, so they are sturdy as well. 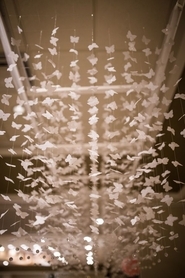 You might like to mix our hanging Butterfly Garlands with Paper Pennant Buntings. We have coordinating colors and styles to make party planning and Decorating painless! 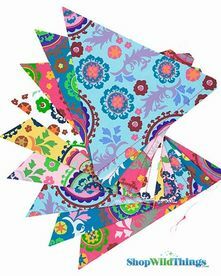 Hang Triangle Buntings inside of a tent to create a magical scene of color. The banners also look amazing lining a walkway. 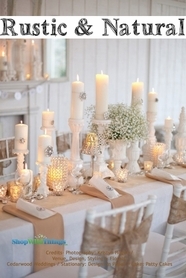 Use Shepherd's Hooks to drape Garlands from one to the next along an aisle. We've found many DIY sites offering adorable tutorials on how to make Triangle Buntings on your own, but we think that your time is money, and you'll be glad to save yours by buying from our adorable and extensive collection. ShopWildThings also offers paper 3-D Garlands that are perfect for swagging along with your buntings and other Decor. Hanging Garlands from our manzanita trees is a snap. Just cut the garland length to create different strand lengths and drape them from ceilings and other floral Decor centerpieces. COMING SOON! Jute Banner 5 pieces - 6.5 Feet Long - Vinyl Backed for Painting! Celebrate a great occasion with our pre-cut jute bunting and pennant banners from ShopWildThings. Choose from several colors of natural jute fabric triangles hemmed at the edges and connected by jute string that you weave through pockets at the top. Use paint or stencils to create your own designs or wording. It's a festive way to say "Just Married," "Congratulations" or "Bon Voyage." Choose sizes ranging from 6" x 8" to 9.5 in. by 12 in. Our linen triangle garland has 12 linen triangle pennants strung together with a pretty white satin ribbon. Each triangle is 8" wide and 10" long. 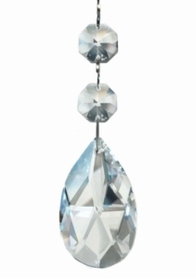 Allowing for about 5.5 inches between each triangle, this piece is 15 feet long. Slide the pennants along the ribbons for shorter lengths. Shop our five-piece jute garland/banner sets. These fabric rectangles have triangular cutouts that you can string together with the narrow twine included with your purchase. The back of each fabric piece has a protective coating to prevent markers and fabric paints from soaking through. Create a great look for a community event, or show off a cause for celebration at a backyard party.